This is the time of the year when I love to open the windows and let all the cool air in and then snuggle under my favorite quilts; the quilts that my grandmother made. It brings back a flood of memories of her and the country house. A modest home full of love, great conversation, wonderful food and a lot of common sense, or “horse sense” as she would call it. Hanging the quilts on the line is something she always did. Come to think of it, I don’t think she had a dryer until much later. I remember her telling me that when the wind blew, it picked up all the smells from around the yard and the quilt would catch it and keep it. Then you could smell all the flowers from the yard, the corn in the field and trees from the grove, all in your quilt as you slept at night. It’s true, you can smell all of it. But what I smell when I breath deep is her, and all the love she put into each square. It’s like getting a big hug from her all over again. Blowing in the wind... excellent shot! cool shot! Grandmas are the best! A fabulous collection of quilts. The fresh air smell is truly wonderful. Love this shot, there is nothing better than the smell of fresh linens off the line. Some really nice work on the colored quilt, your grandmother did a wonderful job. Cool shot, love the composition! Oh I see there is one with wedding rings. My mother made one of those and I loved it. 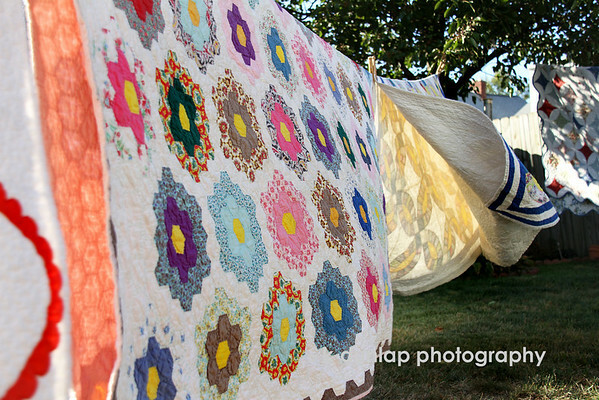 I also remember the wonderful smell from bed linens, quilts, blanket and such being dried in the open air. I still think there is nothing better. Super capture!!!!! Thanks for the memories! Your photos always evoke such wonderful memories for me -- and this one certainly does too. Love it!